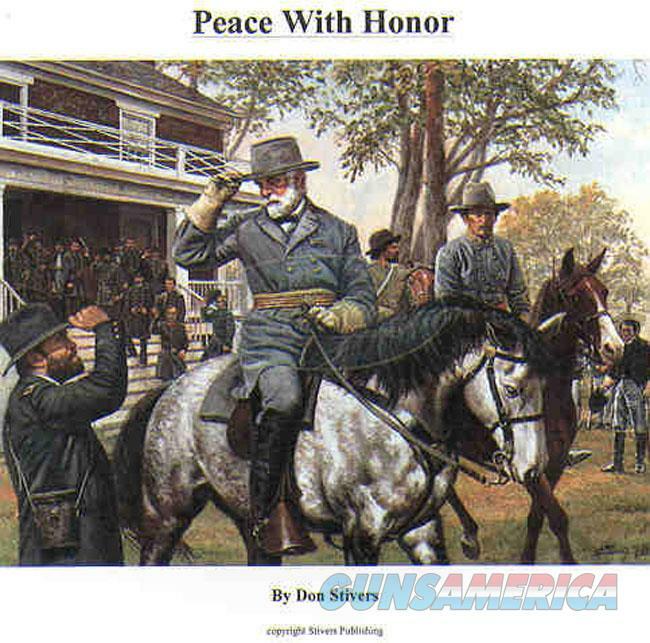 Description: PEACE WITH HONOR A wonderful, limited edition lithograph by the renown military-theme artist, Don Stiver (now deceased). This lithograph was printed in 1988 as a limited regular edition of 1200, all signed and numbered. Of that small edition, you have the opportunity to own serial number #3......yes, a single digit from the beginning of the edition. It is April 9, 1865, at the McClean House, near the Appomattox Court House, Appomattox, Virginia, and General Robert E. Lee and General Ulysses S. Grant exchange the salutes of gentlemen, respectful of each other and of the momentous events in which they were principal participants. The image captures a moment in time when “honor acknowledged honor”. General Lee had surrendered the Army of Northern Virginia to General Grant, and the Civil War was drawing to an end at last. Represented in Stiver’s historical artwork are the following Union and Confederate soldiers: in the foreground are General Ulysses S. Grant, General Robert E. Lee, LTC Charles Marshall (Lee’s secretary); between Lee and Marshall is SGT Tucker; in the background, from left to right, are General Seth Williams, General Adam Badeau, General Horace Porter, unidentified, General Phillip Sheridan, General John Rawlins, unidentified, Colonel Orville Babcock, Colonel Theodore Bowers, General Frederick Dent, General Wesley Merritt, General George Custer, and General Edward Ord. Source of identities: Appomattox Court House Historical Park Staff. Each of these two lithographs is new, unframed, original in all respects and in the original Don Stiver sleeve with accompanying information sheets. These lithographs have been stored flat since release 25 years ago. If you are not picking up this lithograph at our shop in Hiawatha, Iowa, we can ship it to you. PRICE: $2000.00. TRADES FOR VINTAGE COLLECTIBLE FIREARMS CONSIDERED -- SEE DESCRIPTION OF DESIRED TRADE ITEMS.